Remnants of wood provide sculptor John Adamson with visions of human figures at work or play. But his latest carving is a sorrowful memento of a First World War drama in which a German U-boat sank 11 trawlers from the Scarborough fleet in September 1916. 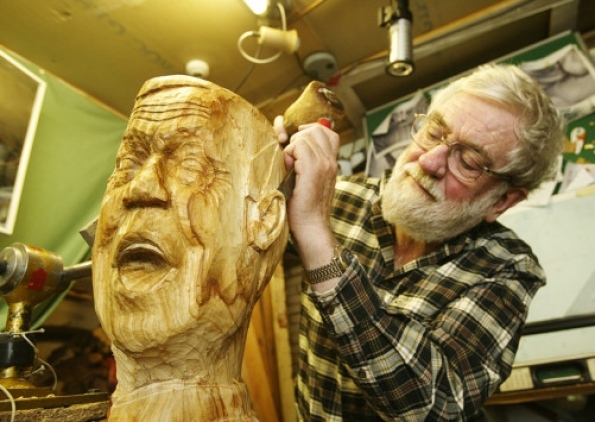 “The wood was an off-cut from a silver birch tree that I was chainsaw carving. I saved it to make a stalk of a 5ft-diameter apple that I was discussing with Manchester Parks and Recreation department but that project fell through due to there being no money for it in the budget. The fisherman’s face is based on his own, as he needs to take measurements to get the facial features in proportion. “I am the only model I know who will always be here when I need them and is prepared to have measurements taken with wooden dividers from sensitive parts of the face,” he said. John, 69, has been a member of the sculptors’ group for about 10 years and says he is the only wood carver among them - the rest work with stone and resin. His interest in carving began when he was an eight-year-old boy, and in his 20s he attended sculpture classes in Birmingham. Born and brought up in the Black Country, he later took a BA in sculpture at the University of Central Lancashire, Preston, at “the ripe old age of 56” and, in the last year of his studies, moved to Hebden Bridge. In John’s hands a pub table top becomes a rural idyll as a ploughed field takes shape. The roots of a tree trunk, skilfully carved, become willowy figures. In some there are aspects of self-deprecating humour, such as in “Imagine You’re a Tree”, harking back to the days of “Music and Movement” sessions at primary school, when youngsters were invited to use their imagination to portray other living things. John portrays himself in his root carving set apart stiffly from the other characters, who move sinuously to imagined music. John said: “I have a preference for the human figure and face but can carve almost anything, given enough reference material. Visitors to Todmorden may have seen his Alice in Wonderland sculpture behind the town’s swimming baths. “Go to the top car park and, with your back to the main road, look to your right,” he said. Lines of Conflict, by 14 members of the Yorkshire Sculptors’ Group, will be exhibited at Scarborough Art Gallery, The Crescent, from October 26 to January next year. The exhibition, which has a First World War theme, is open daily (except Mondays) from10am to 5pm.